Raaga.com: Should film stars be accountable for misleading advertisements? Should film stars be accountable for misleading advertisements? Dancing sensation and popularly recognized as ‘Dhak Dhak Girl’ Madhuri Dixit is in a web of trouble as FDA (Food and Drug Administration) has served her a legal notice for endorsing the popular food brand Maggi. 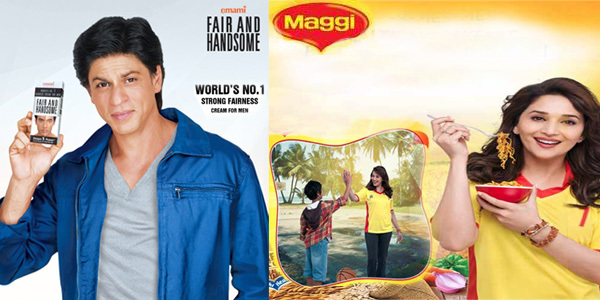 It may be noted Madhuri Dixit is the brand ambassador of Maggi and seen in TV commercial promoting the product as nutritive food for kids. However, after Uttar Pradesh Food Safety and Drug Administration found high levels of lead and monosodium glutamate (MSG), contain in it they have served Ms. Dixit a legal notice seeking Ms. Dixit to reply why she endorsed the product without properly investigating the legitimacy of the product. But Ms. Dixit is not the only actress to come under the scanner earlier superstar Shah Rukh Khan too was in trouble, for endorsing the fairness cream 'Fair and Handsome' by eminent actress Nandita Das. Hence as a protest she urged Emami to take down the Fair and Handsome ad and focus on promoting healthy skin. But the question is should film stars should be accountable for such misleading advertisements? His words have a certain resonance in following the appearance of certain celebrities in dubious commercials. Hence we have to draw the line under those among the rich and famous who abuse their celebrity to help advertisers make fools of us, the customers.